The UrbanWire is giving away 2 pairs of tickets to catch Shakespeare in the Park – Julius Caesar! 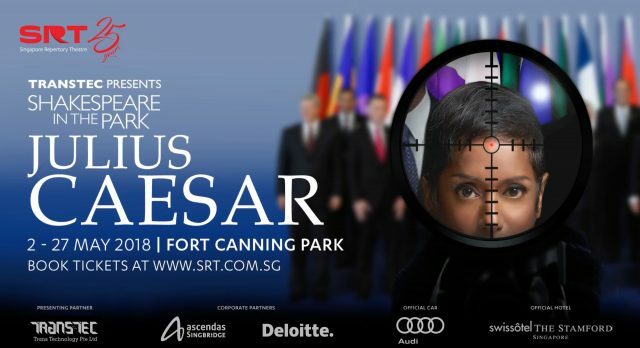 Singapore Repertory Theatre (SRT) is proud to present the return of its much-loved Shakespeare in the Park series – with Julius Caesar. Directed by Guy Unsworth (Hand to God), and inspired by images of the G20 and N.A.T.O summits, this production sees Shakespeare’s political thriller brought to life against the backdrop of global current affairs. Ambition, power, and greed collide as the leaders of the R.O.M.E 7 countries gather. Plots to assassinate the ever-ambitious Caesar are hatched. Are his conspirators truly doing a righteous deed? Or is chaos and defeat inevitable? Starring Jo Kukathas (Romeo & Juliet) as Julius Caesar alongside Ghafir Akbar (Disgraced), Daniel Jenkins (Romeo & Juliet, Hand to God), Thomas Pang (Romeo & Juliet) and Julie Wee (The Merchant of Venice). At arguably the biggest Shakespeare production of its kind in this part of the world audiences look forward to spreading their blankets under the stars to picnic and enjoy the Bard’s best-loved plays in the uniquely beautiful setting of Fort Canning Park. Stand a chance to win a pair of tickets to Shakespeare in the Park – Julius Caesar! This contest will run from 24 Apr to 27 Apr. [CLOSED] Win a pair of tickets to Shakespeare in the Park—Romeo & Juliet! Ads help us fund the site. This link opens in a new tab. Subscribe to our newsletter for more updates!